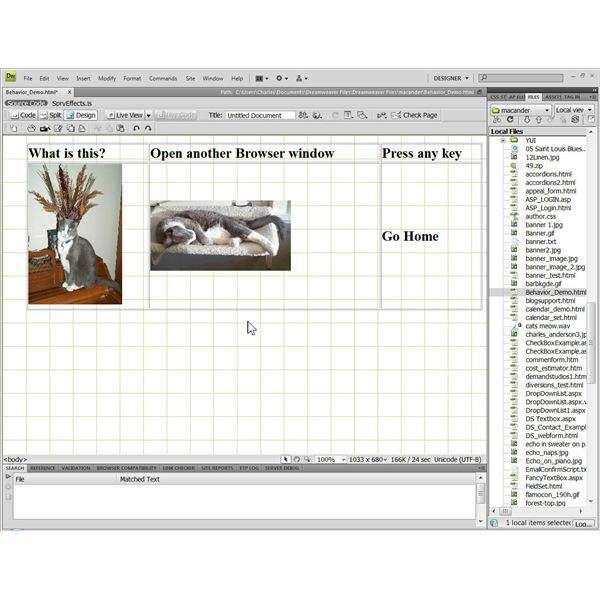 All of the Behaviors in Dreamweaver involve two elements—events and actions. Every defined event will trigger some action. An event can be many different things such as a mouse rollover, a click, or even printing a page. Examples of actions image swaps, opening a new browser page, or effects like causes text to disappear and reappear. Your Web page should look like the attached image at this point. The image here shows an abbreviated list of the Behavior events. Highlight the top cell on the left on the Web page table. Click on the “+” sign in the Behaviors panel. Select “Popup Message” from the drop down list. Type some content into the Popup Message box that appears such as this: “This displays a popup message of explanation.” Click “OK.” Select the onMouseOver event from the list of Behaviors. Select the second cell in the top row of the table. Add a new Behavior with the same method, but this time select “Open Another Browser Window.” In the properties window that opens, type this in the URL to display box: https://www.brighthub.com and make the window width and height 300. 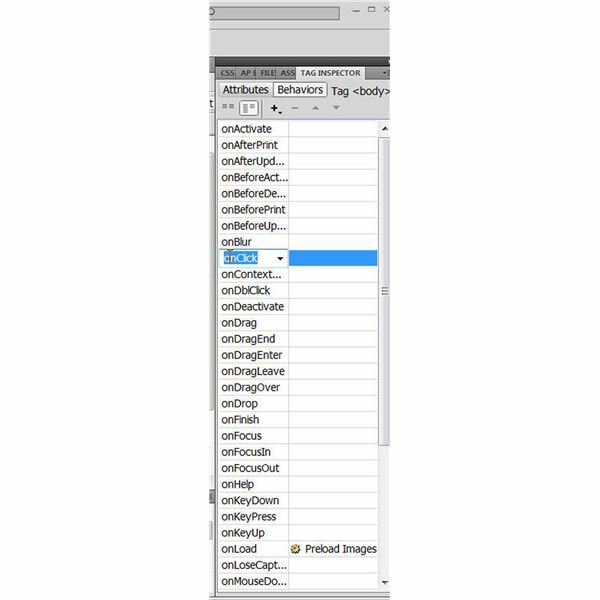 Check some of the attributes as desired, such as the “location toolbar” and the “scrollbars as needed.” Give the window a name like “BrightHub2.” Select “onDblClick” for the event. In order to make this work on a server, you will need to upload any associated files you created as well as the HTML page. It is easy to get some of the Event selectors wrong or set more than you want. You can check this by changing to the Code view in Dreamweaver and comparing the patterns in the Actions/Events that are working correctly to the problem areas. Using Dreamweaver’s Live View and Live Code is a good way to do this.